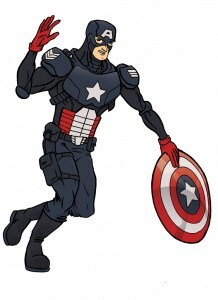 This week’s Fan Fun Friday involves Captain America, notably Derek Toye’s design for the fighting boyscout. You can check out Derek’s illustration webp age and his blog. I first saw Derek’s work on Project: Rooftop and with the movie released, I’d try my hand at his design. Check out the original design Derek did. Captain America belongs to Marvel comics. Redesign by Derek Toye. Drawing of redesign done with explicit permission.